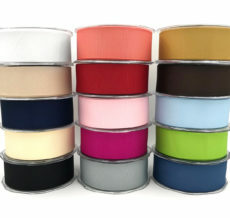 Bask in the glow of our new NEON grosgrain! 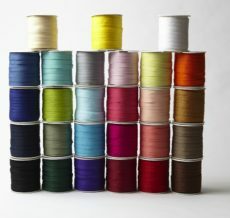 Vibrant, fierce, and assertive, these softly woven grosgrain colors pack a punch with 27.3 yard (25M) to a roll. May Arts’ woven GN series grosgrain is a woven Petersham-esque grosgrain. Because it lacks the traditional thick edging of an American style grosgrain, it is softer and more supple. The weight and pliability of the ribbon makes it versatile for everything from gift wrap to sewing to scrapbooking. Sewing uses can include use as a trim on everything from blankets to tote bags, dresses, and more since it can be ironed on an edge. The supple nature of the ribbon also makes tighter knots when tying than our traditional grosgrain for crafting projects. Pair the bright colors with black or white to really make them pop. The ~3/4″ (18MM) width is a great width for awareness ribbon pins.